This past year has been a very difficult year for me in a couple of ways. First, I had several illnesses (which is unusual for me), struggled with a low energy level, and suffered with discouragement in some areas of my life. Second, because of said illnesses, low energy, and discouragement, my emotional state tended to swing up and down, not dropping into a major depression or anything but leaving me with quite a bit of what I call "blah-ness." So, I have to admit that I'm not terribly sad to see 2013 come to an end! Over the past few weeks, I've been thinking about 2014 and setting a few goals to insure it is a better year overall. First and foremost I'll be focusing on my health, losing weight, getting my energy level back up, and keeping a positive attitude. I'll also be working to declutter, organize, deep clean, and re-decorate each room/space in our home. In addition to these things, I have chosen a word for 2014 and signed up for Ali Edward's One Little Word class. 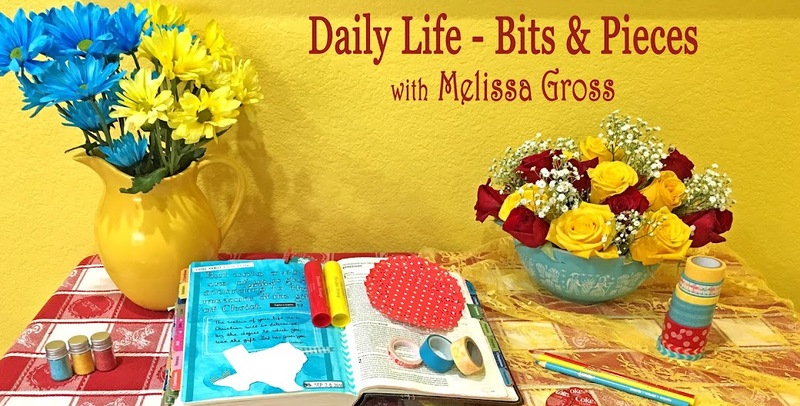 I'll be sharing my word and a few of my plans for 2014 tomorrow as the new year begins! 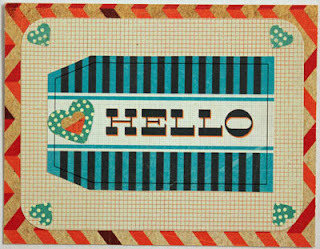 Happy New Year's Eve - see you in 2014! 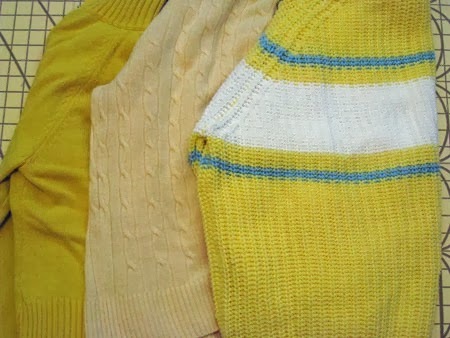 Over 20 years ago, Mama & Daddy gave me a yellow sweater for Christmas. It has been one of my favorite sweaters ever since then, but I haven't worn it much the last few years. I've known it was time to let it go, but it's such a happy sweater and there are so many memories associated with it that I've just kept it in my sweater pile. 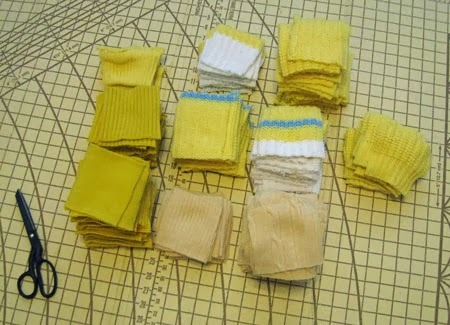 Then I cut those sweaters into 4"x4" squares. 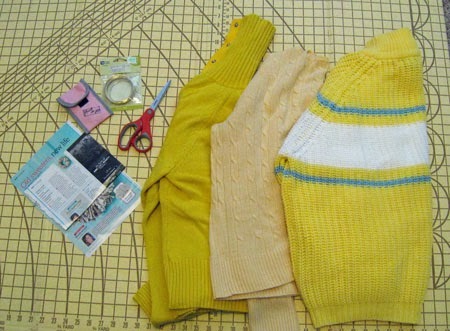 The directions suggested using 6-8 old sweaters to cut about 130 squares. Since I only had three sweaters, I was careful to cut as many squares as possible from each one. I ended up with almost 200 squares! 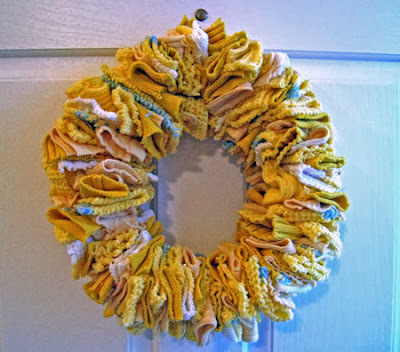 I sorted them so the different colors and textures would be spread throughout the wreath. Then I folded each piece in half & threaded it onto a piece of the wire until it was full. Robbie helped me form a loop in the wire and hook the two ends together to form the wreath. 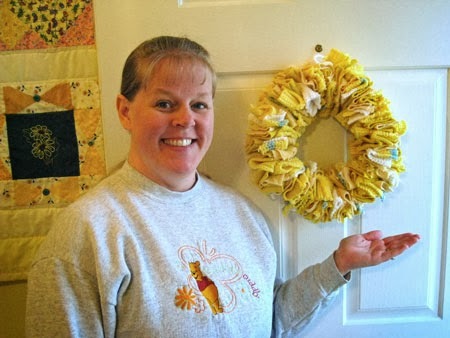 I'm so excited to have this new wreath and to know that I'll be able to continue to enjoy my favorite sweater! After my post about Civil War history, which contained three books reviews, Barbara recommended The Widow of the South by Robert Hicks. This historical fiction book is based on the true story of Carrie McGavock whose plantation is used as a Confederate army hospital during and after the Battle of Franklin, Tennessee, during the Civil War. When she heard that the plot of land where many Confederate soldiers had been buried was going to be plowed under, she had the bodies of 1400+ soldiers re-buried on her land. This was an excellent book, which I highly recommend. 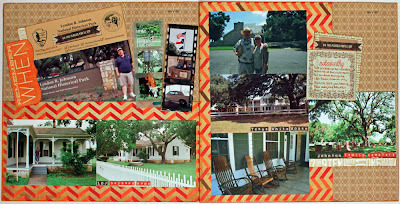 Next time we are in Tennessee, we will be planning a trip to Carnton Plantation. My final book for this year is All the Best, George Bush: My Life in Letters and Other Writings by our 41st President, George H. W. Bush. This 700+ page book was a fascinating read as it contained letters and diary entries written by President Bush, beginning when he enlisted in the US Navy as an 18-year-old in 1942 and ending with a letter to his first great-grandchild in 2011. The letters he wrote to his mother during his time serving during World War II were fascinating to read, especially as he described being shot down & rescued near Chichi Jima - his concern & care for others was evident as was his loyalty to the United States. The letters range from long letters regarding policy written to foreign dignitaries to short funny notes to friends & family. A great read - I highly recommend it! There are only a few days left in this year, and I'm planning to spend my reading time enjoying a stack of magazines that Robbie picked up for me last week! I already have three books on my nightstand to begin 2014. I'm also planning to begin reading the Pulitzer Prize winners in fiction, beginning with the first winner in 1948 (when the novel category was renamed fiction). What are you planning to read in 2014? 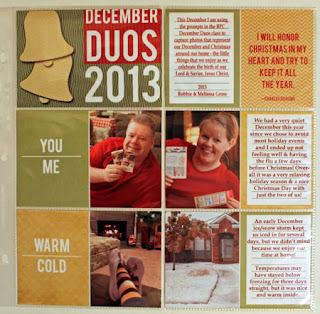 I did, however, participate in BPC's December Duos workshop. The class was designed around sets of words (warm/cold, red/green) and over the course of the 12 days before Christmas a different teacher shared examples of photos and inspiration. The idea was to use an 8x8 Project Life album with divided page protectors, but I decided to include my duos in my 2013 album. Here's how these will look in the 12x12 divided page protectors. 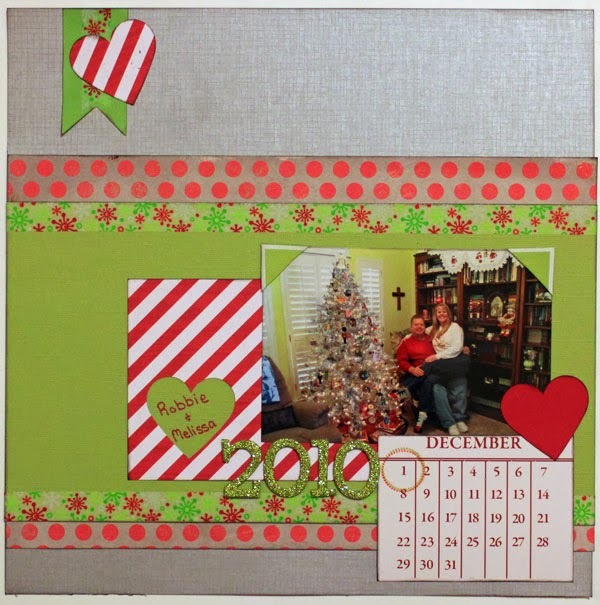 How did you document your December this year? The only product I added (other than adhesive) was chalking ink, and I ended up with two 2-page layouts, one 1-page layout, and two cards. 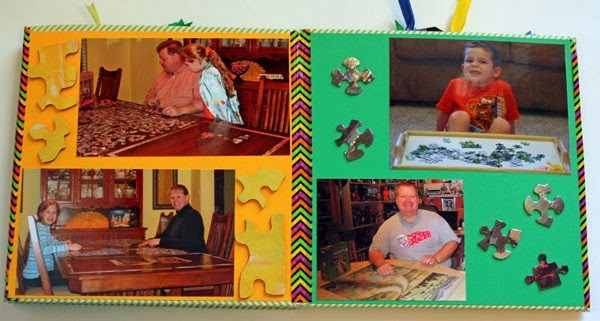 There's a holiday layout, a travel layout, and a school portrait layout with photos ranging from 1974 to 2012. 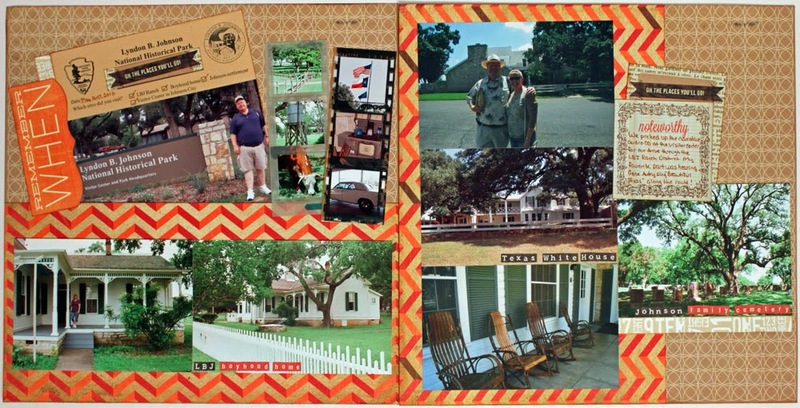 Journaling reads: We picked up the narrative audio CD at the visitor's center for our drive through the LBJ Ranch. My favorite part was hearing Gene Autry sing "Beautiful Texas" along the way. Journaling reads: It's easy to see that I didn't want my picture taken. What's not so obvious is that my Kindergarten teacher sat me on her lap hoping I would relax and smile. Finally she simply leaned back so the photographer could get this shot! 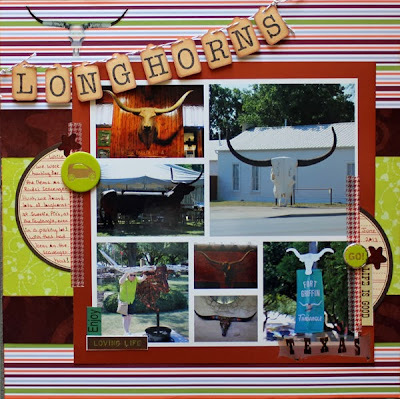 I'm thrilled with the variety of items I was able to create with these great products. Do you have a favorite product line that you've worked with lately? One of my goals this year is to post a short review of each book I read, so today I'm sharing my thoughts on six non-fiction books I completed over the past few months. Quiet: The Power of Introverts in a World That Can't Stop Talking was one of the choices for the library book club. It is a fascinating look at introverts and their impact on our world. I especially enjoyed the insights on how our school systems favor extroverts and what can be done to help introverts thrive. There are so many insights in this book that I highly recommend it for everyone, especially teachers and parents of introverts. For a quick look at what the book is about, check out the author Susan Cain's Ted talk here. I read Outliers: The Story of Success as part of an online book discussion for Continuing Professional Education credit. This is the first book I've read by Malcolm Gladwell, and I thoroughly enjoyed his look at the various circumstances and reasons behind why a person is successful - where he's from, when during the year he was born, his culture and family background, etc. It's extremely thought-provoking and another one that I highly recommend. After enjoying Outliers, I checked out Blink: The Power of Thinking Without Thinking from the library. In this book, Gladwell takes a look at how quickly we make judgments and what types of information we can learn from just a small section of time. I was actually reading this book the morning we had to make a trip to the emergency room (because Robbie inadvertently sliced a little piece off the end of his finger and we couldn't stop the bleeding). Knowing there might be a wait in the ER, I grabbed the book. The attending physician (who successfully staunched the bleeding) noticed and commented that he had read it in medical school. There's a whole chapter on how you can determine which doctors are the most likely to be sued just by watching a few seconds of silent video of patient/doctor interaction. This is another thought-provoking book that I highly recommend. I first read The Color of Water: A Black Man's Tribute to His White Mother when I was teaching at a junior college the year before I met Robbie. I'm not sure how I came across it, maybe someone recommended it or I just picked it up at a bookstore. I remember when I was reading it because one of my students, a young white lady, was seriously dating a black man. One day after class she mentioned to me that he wanted to get married, but she had reservations particularly because she had two white children at the time. (I realize in this day and age that this concern may seem unfounded as there are many mixed marriages, however I do live in the deep south where prejudices can still surface at times so her concerns were probably well-founded.) I thought this book was a wonderful look at how James McBride, a black man, expressed his love and admiration of his white mother while also acknowledging the difficulties associated with a mixed-race family. Something (I can't remember what) made me think about the book recently, however I couldn't remember much about the book itself (although I remembered all this other stuff).I must have given my student the copy of the book I had because I had to check this one out at the library so I could re-read it. We've had Fast Food Nation: The Dark Side of the All-American Meal in our personal library for several years - Robbie purchased it and read it soon after it was published in 2001. When Cheri was here visiting earlier this year, we attended a one-hour discussion at the library about healthy eating. The librarians provided a list of recommended books to learn more about healthy eating and the issues that have led to so much obesity. This book was on the list, so I pulled it from the bookshelf one day to read. I don't know how many changes have been made in the fast food industry since this book was published, but I hope there have been a lot based on the information about how fast food has shaped our nation, the number of injuries and unsafe working conditions that exist within the meat packing industry, and the effect this has all had on our diet here in American (and worldwide). Somewhere I had seen a quote from Stephen King's On Writing: A Memoir of the Craft and had added this book to my to-read list. The first part of the book is a memoir with short stories about Stephen King's life, from the first stories he wrote for the neighborhood newspaper his brother printed in their basement to his first bestseller. In the following sections, he discusses the craft of writing including that writers are also avid readers, grammar is important, and the many tools that a writer needs in his toolbox along with the determination to spend hours writing. He was in the midst of writing this book in 1999 when he was hit by a van while he was walking along a country road near his home. 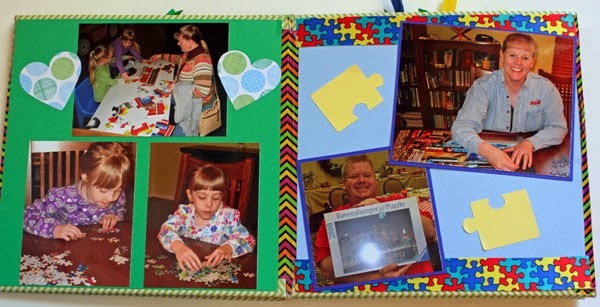 The last section of the book tells about his months of recovery and how writing helped him in the healing process. A very interesting book (although it contained more profanity than I thought was necessary - an issue that he actually addresses in the book). I'm in the midst of a 700+ page book right now that I plan to finish before the end of year, so I'll be back with one more book review roundup post soon. Do any of these books sound interesting to you? Have you read any of them? I'd love for you to share your thoughts in the comments. I emptied another one of my Project Files recently! 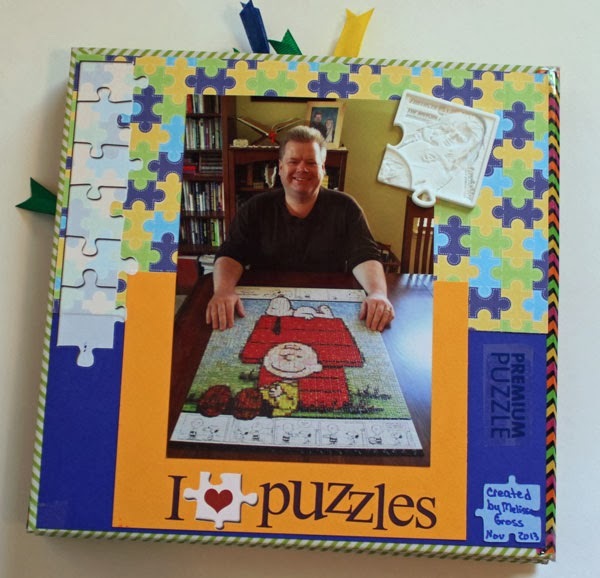 The file contained photos of me & Robbie and our family & friends putting together puzzles over the past seven or so years. 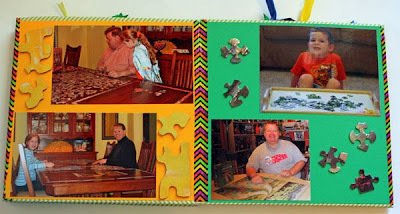 We regularly have a puzzle in progress on one table or another here at home, and I (of course) often snap photos as we're working on one or when one is complete. I pulled out my mini-album bin and discovered a chipboard 8x8 accordion style album that has been in my stash for at least three years. I knew it would be perfect for this project. I covered the edges of the album with washi tape, then covered each page with cardstock or patterned paper. I had one piece of puzzle patterned paper, which I used on the front cover, with a few extra pieces scattered throughout the album. I've saved some miscellaneous puzzle pieces in my Project File over the past few years, mostly from old puzzles that we picked up at garage sales and discovered a piece (or two or three) was missing! 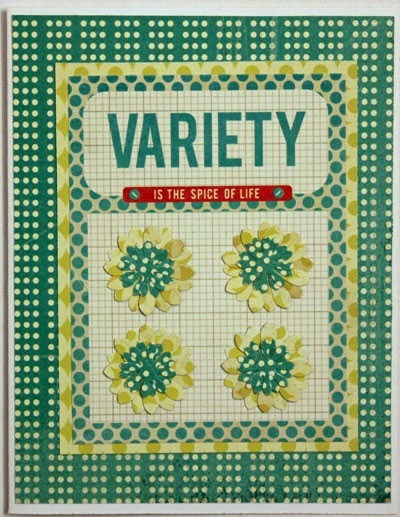 Other pieces were cut with my Cricut or came from a cute post-it pad Robbie got me for my birthday. I scattered these pieces throughout the album. 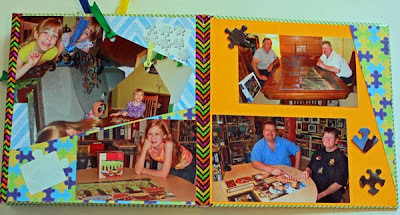 The mini-album had several pockets, which allowed me to add lots of extra photos as tags. Here's a look at the back cover. 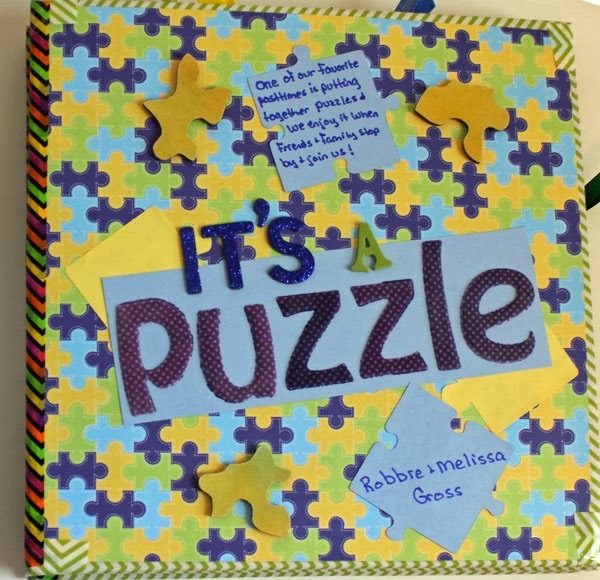 I added some rub-ons and a special puzzle piece that Robbie contributed from his Fantastic Four trading card set. So, that's two Project Files I emptied in 2013, completing projects that I've been planning for a couple of years! (The other was my Games We Play mini-album.) 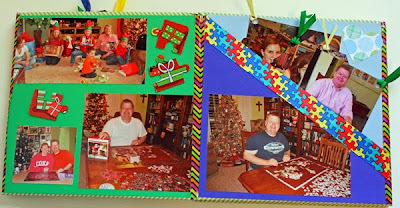 I have several more of these files that I'll be working on 2014 - a Music mini-album, a Teaching scrapbook, and an album for my 2012 & 2013 Summertime Scavenger Hunt photos. 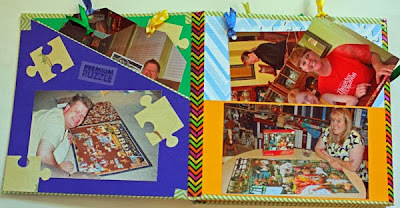 Do you use Project Files to collect items for future projects? 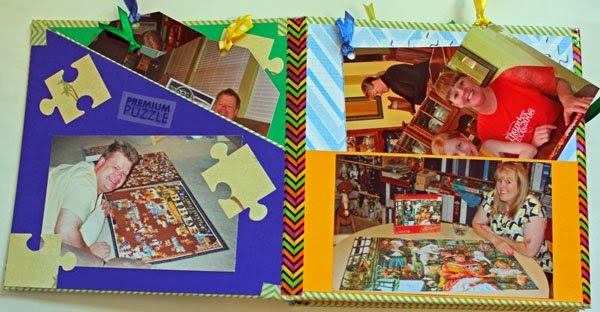 Which projects are you planning to work on in 2014? Today I'm joining the other members of the design team at Scrappin' Goodtime for a Holiday Open House. There will be delicious treats, surprise gifts, discounts, and a variety of Make & Takes throughout the day. It's going to be a fun & festive time! I'll be hosting a Make & Take table where customers can create punched washi tape embellishments using red & green washi tapes and a variety of punches. 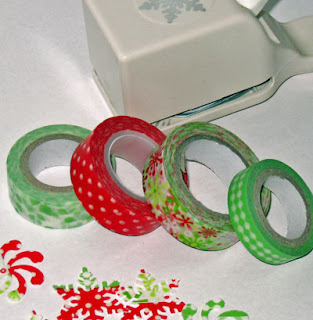 I created a few items to show how these embellishments can be used, like on the washi tape + three cards I shared last week. 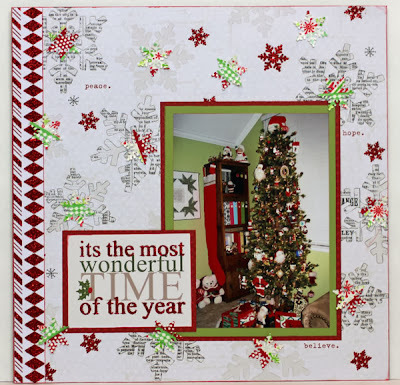 Here's a layout I created with some of the punched snowflakes. 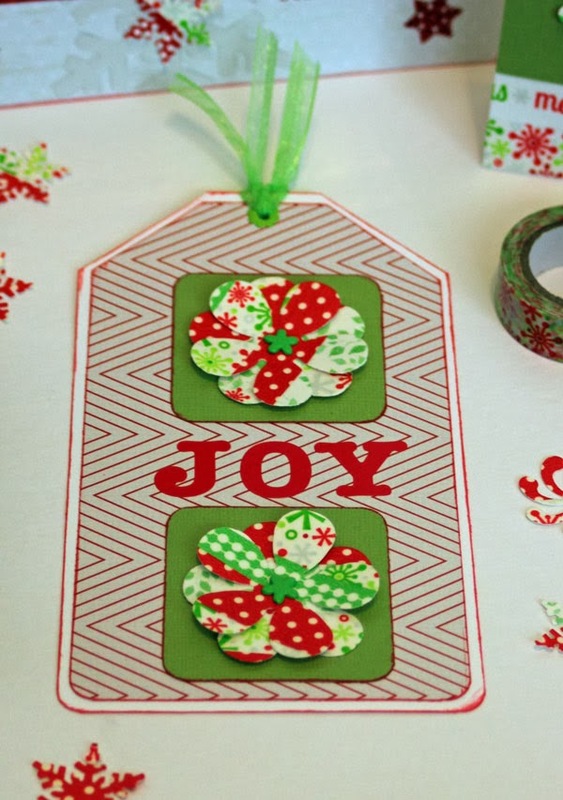 And a tag that can be used on a layout or a card or a gift. 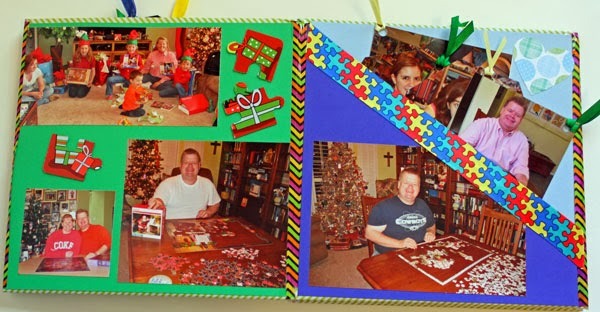 Does your local scrapbook store host an open house this time of year? Are you planning to attend? Just sharing a couple of layouts today. 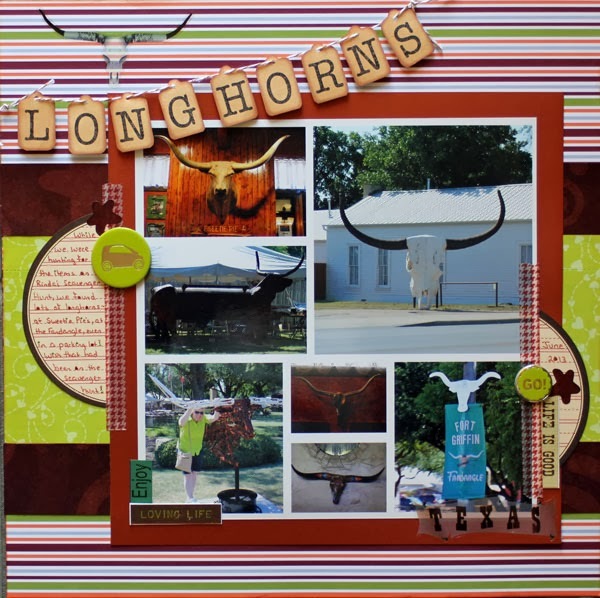 This first one showcases the 8x8 photo collage I created of the longhorn photos I took this past summer. 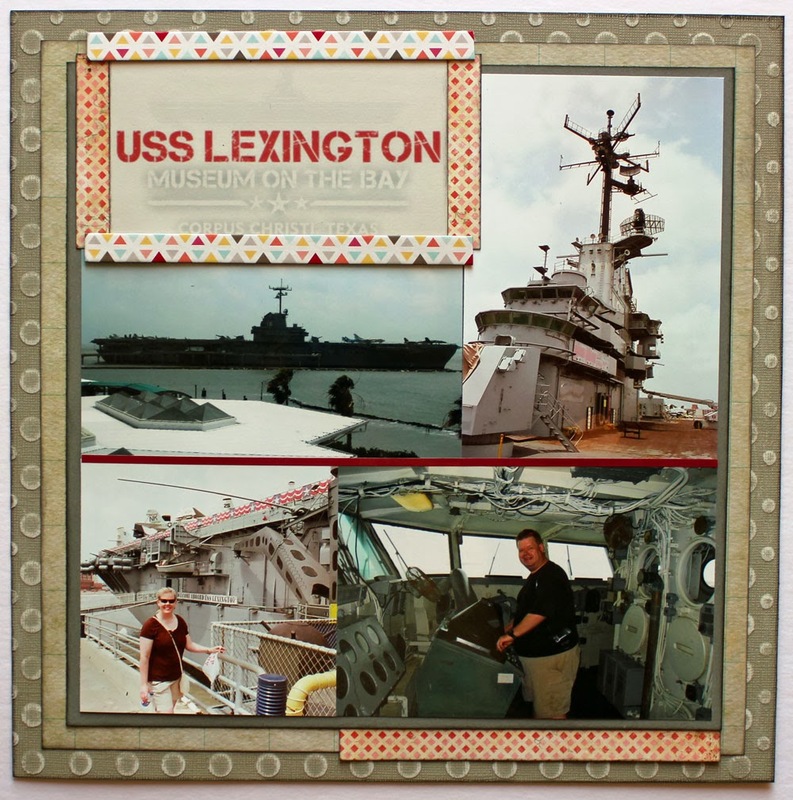 And this second one showcases a few photos from our tour of the USS Lexington back in 2010. 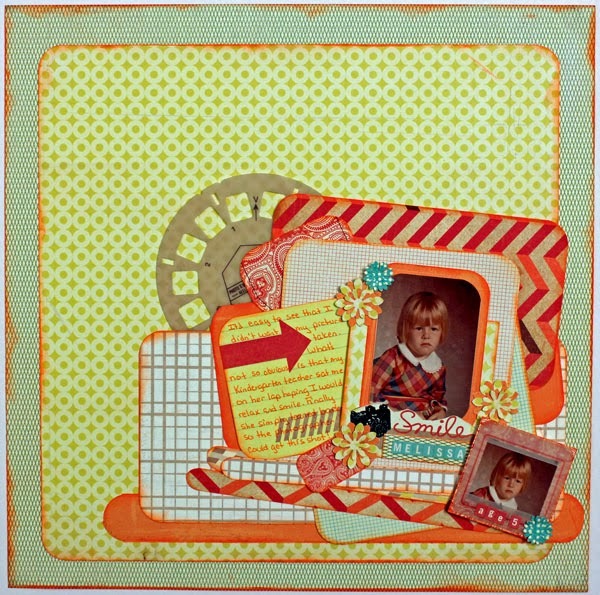 I've been scrapping quite a bit lately, enjoying time in my happy craft room. 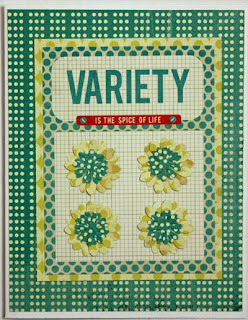 Have you had time in your crafty space lately? It's been VERY cold here . . . with lots of ice, and even some snow! Yep, right here in Texas . . . and I have been staying inside where it's nice and warm and beginning to look a lot like Christmas. 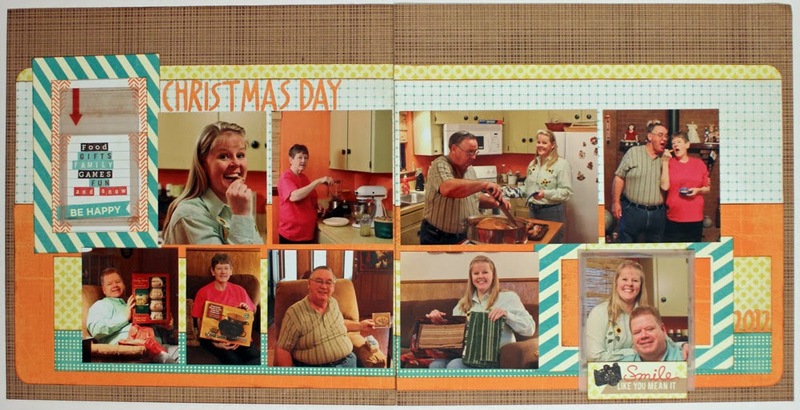 Here's a layout I finished recently showcasing a holiday photo from 2010. 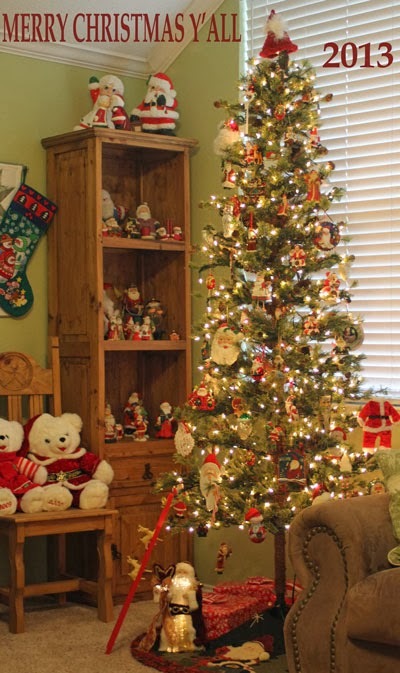 Is it beginning to look like Christmas at your house? 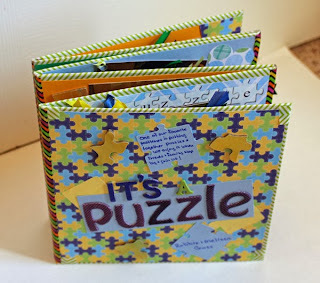 Another book review catch up post today - this one to share about a wonderful series of books I read a couple of months ago. A Lineage of Grace is a series of five books by Francine Rivers. Each book is a fictionalized account of the life of one of the five women who are listed in the lineage of Christ in Matthew Chapter 1 - Tamar, Rahab, Ruth, Bathsheba and Mary. I was excited to find all five books on the shelves at our local library, so I checked them all out and read them straight through. I thoroughly enjoyed these well-written novellas as they helped me better understand what life was like for these women who played such an important role in history. The stories also helped me relate to them each as individuals, thinking about how they are similar to women today and how they endured various hardships or circumstances. They also made me want to go back to the Biblical account of each women and see exactly what the scriptures had to say. I love it when a book points me back to the Word of God and helps me grow in my knowledge of the Bible and grow closer to the Lord. I highly recommend this book series! 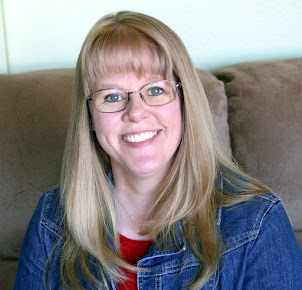 Have you read this (or any other great Christian fiction series) lately?